Like we said in our mid-week post, we bought some different vegetables this week, one of which being asparagus. 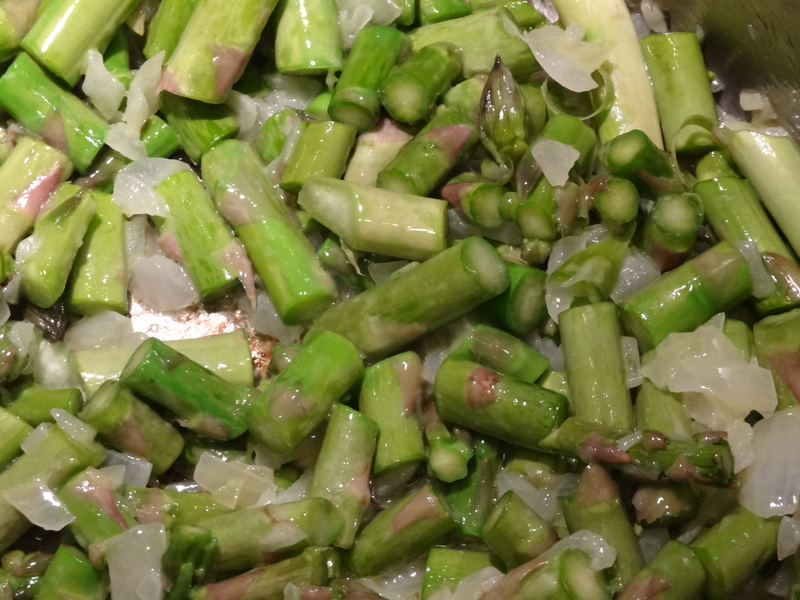 We have previously used asparagus to make a delicious egg and asparagus ravioli, but with it being winter, and us being fairly tired, we wanted to make a simple (yet delicious) soup. 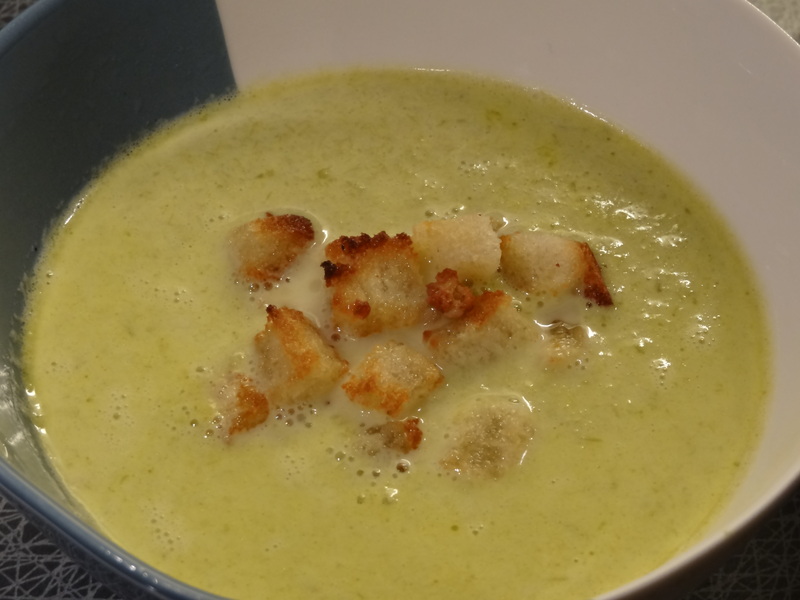 This soup is full of flavour, and can be adapted easily to have more vegetables (celery is quite nice in it) or with other spices. Asparagus is a really healthy vegetable, and is packed of vitamins, fibre, and other health benefits (antioxidants and glutathione, to name but two). Melt the butter in a large saucepan on a medium heat and add the onion. Let the onion cook for about 5 minutes. Snap the asparagus where the white part transitions to green, throwing away the harder white part. Chop the remaining part of the asparagus and fry in the pan with the onion for 2 minutes. Let the water boil for about 5 minutes before turning the heat down to let the soup simmer. Remove the crust from your bread. Put a piece of baking paper on an oven-proof tray. Put the cubes on the baking paper and pour some oil on top. Make sure all the cubes are soaked in oil. Remove the croutons once they are golden brown. You can put them under the grill, but be careful not to burn them. After letting the soup simmer for about 10 mins, add the cream and mix well. 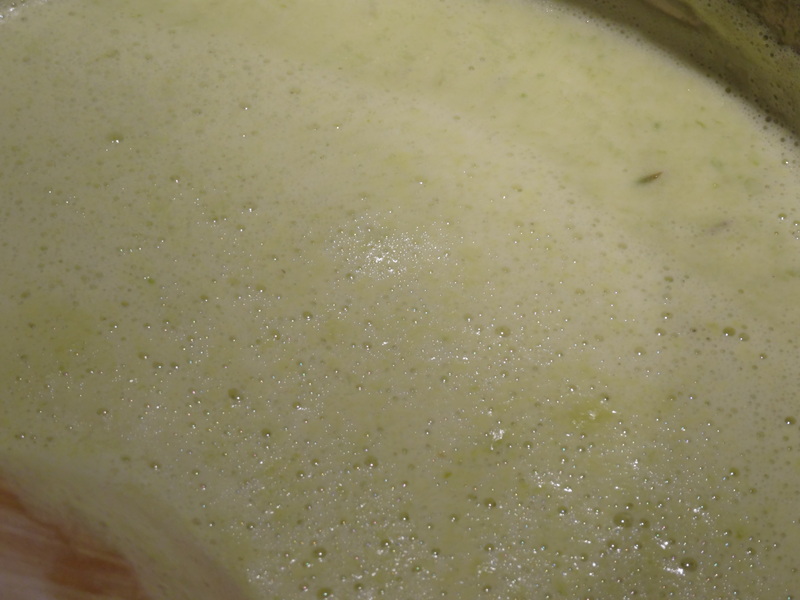 Using a hand blender, blend the soup into a smooth, creamy mixture. Pour the soup into bowls and sprinkle the croutons on top. This entry was posted in Dinner and tagged asparagus, dinner, glutenfree, homemade, quickfood, soup, vegetarian on 2015-01-08 by activebeans.